Abruzzo is a region on the east (Adriatic) coast of central Italy, situated halfway up the ‘boot’. Its immediate neighbors are Marche to the north, Lazio to the west and south-west and Molise to the south-east. Winemaking traditions in Abruzzo date back to the sixth century B.C. thanks to the Etruscans, who played a major role in introducing viniculture to the area. Historically a poor area, viniculture in Abruzzo was sidelined for many centuries as the area’s population went into decline. The last 40-50 years have seen a renaissance in winemaking through the endeavors of a number of cooperatives as well as a new generation of oenologists. Abruzzo is now flourishing and continually gaining economic ground, gradually moving towards producing more quality-driven wines, with an increase in boutique wineries. Abruzzo has at least 89,000 acres (36,000ha) of land planted to vines, with an annual production of more than 92,000 gallons (3.5 million hL). The geographical makeup of Abruzzo is quite remarkable. A rugged, mountainous region with a lengthy coastline, its lush, green landscape is scattered with national parks and forests. It is not surprising that Abruzzo provides a perfect haven for grape growing. Vines flourish thanks to the terroir, the abundance of sunshine, the generous rainfall and a variable climate: warm and dry on the coast and more continental (hot in summer and cold in winter) inland. 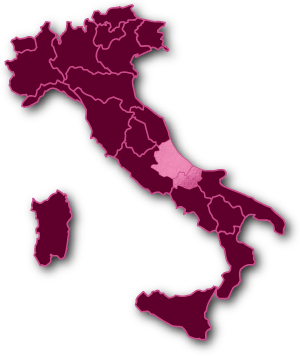 The majority of vineyards are found in the hilly areas, 75% of which are in the Chieti province and the remainder situated in Pecara, Teramo and L’Aquila. Typical Abruzzo viticulture allows for pergolas, where the vines are trained upwards towards narrow arbors. This style accounts for approximately 80% of the vines, while the rest are new and planted in rows. Abruzzo is home to one DOCG – Montepulciano d’Abruzzo Colline Teramane – and three DOCs: the red and Cerasuolo Montepulciano d’Abruzzo and the white Trebbiano d’Abruzzo are the most noteable, followed by the lesser-known Controguerra. The star grape varieties of the area are the native red Montepulciano and white Trebbiano, with minor roles being played by a few international varieties such as Chardonnay, Cabernet Sauvignon and Merlot, and natives such as Sangiovese, Passerina, and Pecorino.